It was a beautiful sunny day with the temperature climbing to 20 degrees as we walked. Hiking north on the Credit River from where we left off last week in Eldorado Park isn’t possible. The river flows through Lionshead Golf Course which is considered to be Canada’s most difficult course. 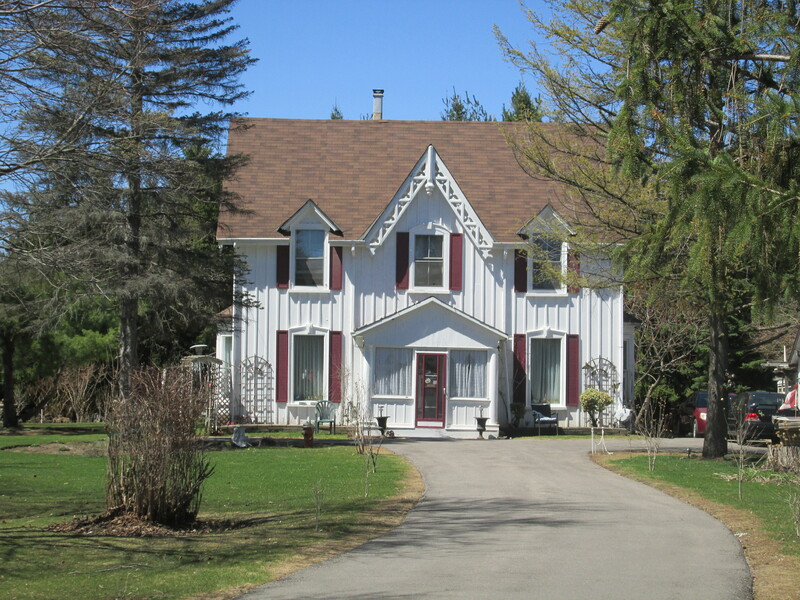 The course extends across 520 acres all the way to Mississauga Road. 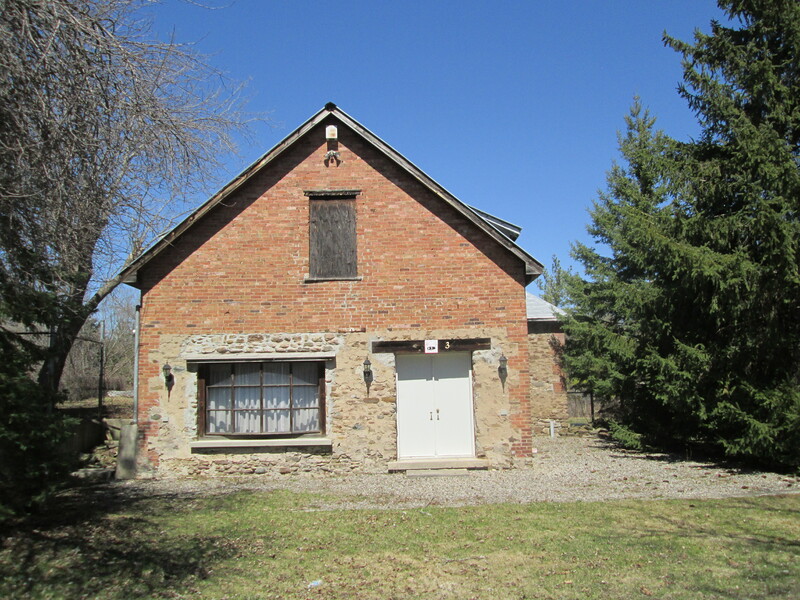 Huttonville grew around mills that were established on the Credit River at Mississauga Road. Today the river through town is clearly posted as no trespassing. When the area was first settled around 1820 it was called Brown’s Mills after the grist mill. The locals also tended to call it The Wolf’s Den after the creatures who lived in the forests and hunted their livestock. James Hutton bought the mills in 1855 and renamed them Hutton’s Mills. 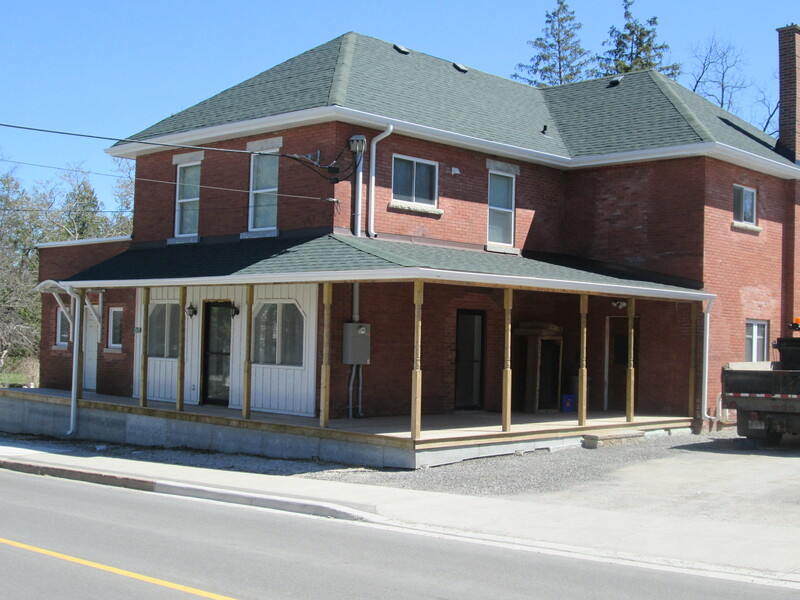 When he opened the town’s first post office the name Huttonville was adopted. We parked on the small section of old Mississauga Road where Queen Street dead ends just above Huttonville. There are a couple of abandoned houses rotting in the woods here whose pictures will be presented on our Facebook page. We went for a walk along River Street where you can see the old mill dam in a few places. We stopped to talk to the property owners who were tending their gardens. They told us that Hurricane Hazel (Oct. 15, 1954) had done some serious damage to the dam. They graciously allowed us access to take a few pictures. The picture below shows the dam with the sluice gates on the right. 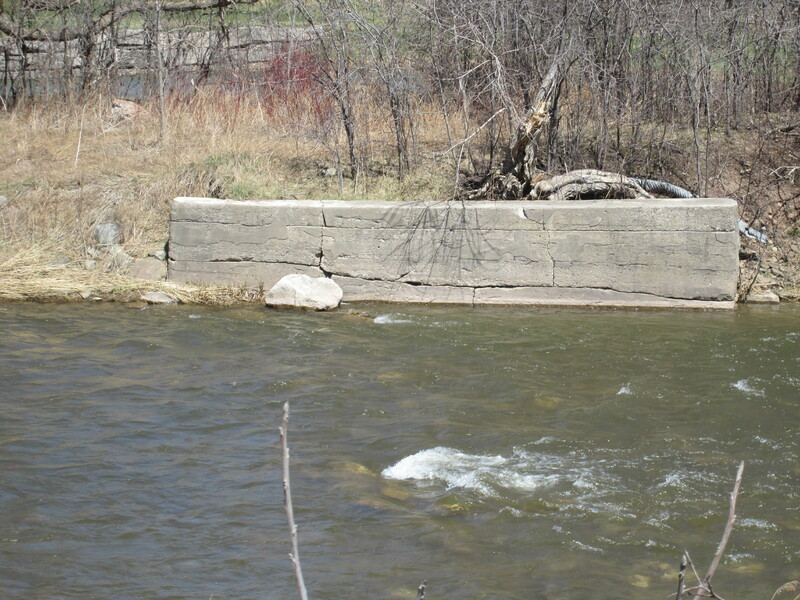 The dam has a distinct lean to it as it reaches out into the river. It was built in 1923 it was the fourth dam constructed at this site. 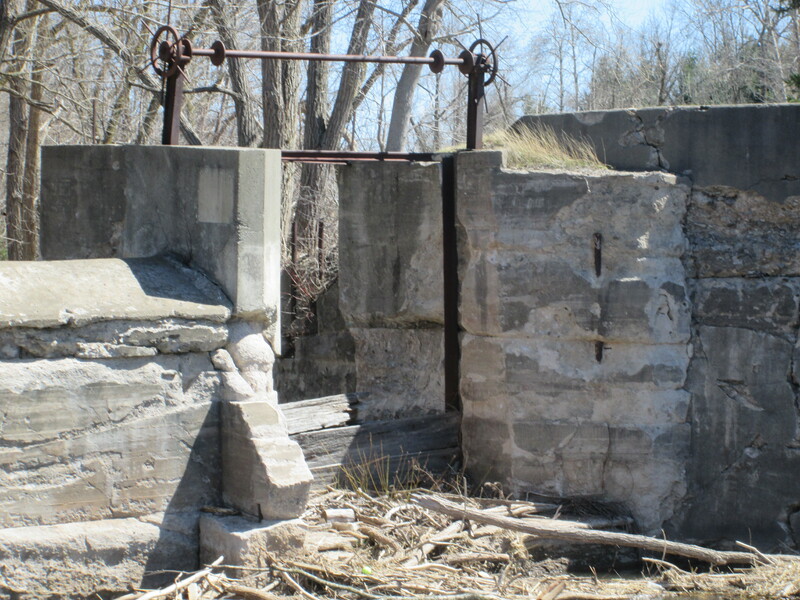 Sluice gates are the part of the dam used to control the flow of water out of the mill pond. The miller wants to have a consistent flow of water to turn the wheel or turbine at a steady pace in the mill. 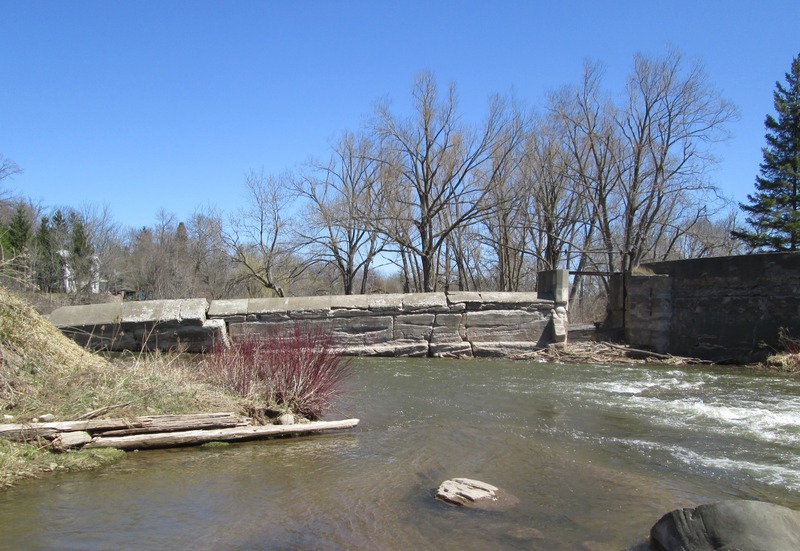 By raising or lowering the sluice gates he can continue to operate the mill at times of either high or low water levels in the river. The sluice at Huttonville is an excellent example of how this worked. The steel cranking system still stands above the gateway while the remains of some of the boards are in the bottom. Behind this gateway is the head race that carried the water to the mills on Mill Lane. 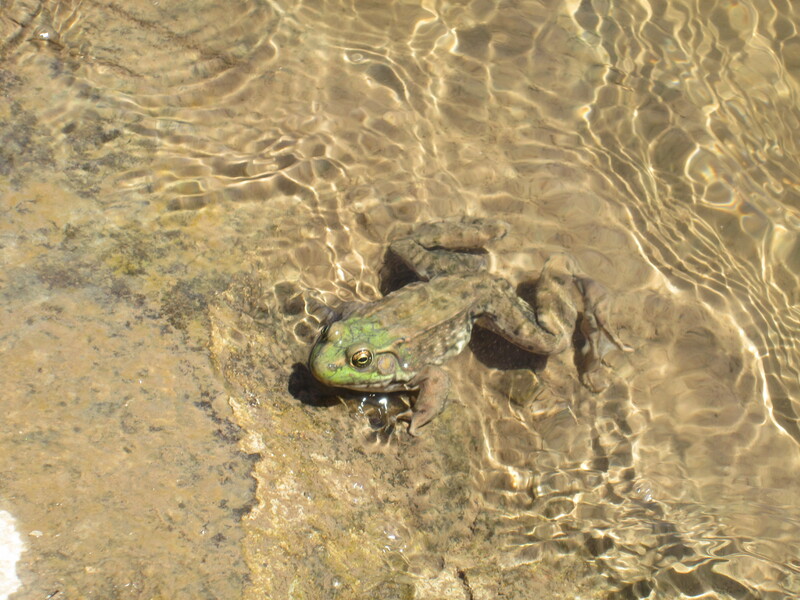 The American Bullfrog lives an average of 8 years in the wild. During the winter they lay on the mud at the bottom of the river. They can’t dig in the mud like turtles do for the winter because they don’t actually hibernate. Instead they turn the body fluids in vital organs into glucose so that it doesn’t freeze. If it gets too cold they will stop breathing and their hearts will stop beating. When they warm up above freezing their bodies start to function again. As we were enjoying the old dam we saw many pairs of cormorants flying up the river. Cormorants usually eat small fish but if one of them spots this frog sunning itself on the concrete of the old dam, this is one frog that won’t make it to 8 years old. 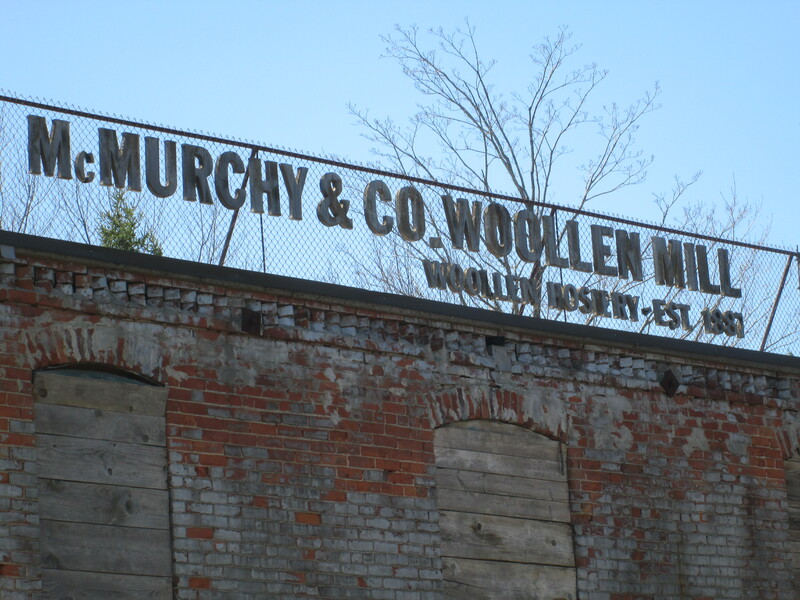 In 1887 John McMurchy built a woolen mill that was powered by it’s own private power house. Built of red brick it has since been painted over in an drab grey. With a staff of 30-35 employees the mill’s main product was socks. During the first world war it produced the socks used by the military. After 65 years of production the mill was closed in 1953. The following year Hurricane Hazel would destroy it’s dam. The original signage still stands on the roof of the building facing Mississauga Road. The cover photo shows the mill during it’s prime. A powerhouse was built onto the grist mill in 1885 by Hutton to power his mills. It generated 100 horsepower of electricity and was considered an engineering marvel at the time. 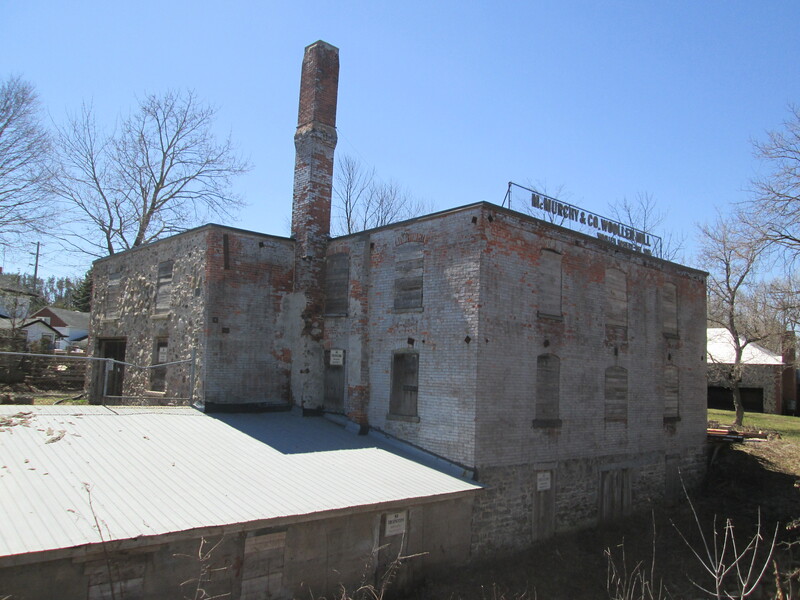 Along with the mills, it provided power to Huttonville and Brampton. When John McMurchy bought the plant in 1903 he increased it’s production to 300 hp. It provided power to Brampton until 1911 when the town went onto the public grid originating at Niagara Falls. It continued to be a personal power supply to the mills until 1953 when they closed. 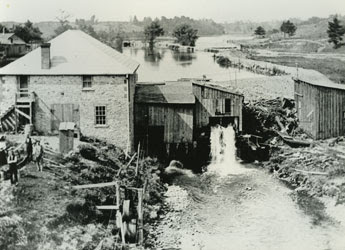 The historical photo below shows water flowing from the Huttonville mill pond through a shed where it is turning a turbine. The little water fall drops it into a settling basin before the tail race returns it to the river. Bloodroot is the white flower in the foreground of the picture below. It is one of the first flowers in spring but it’s flowers last only a couple of days after being pollinated. It gets it’s name from it’s blood red roots. 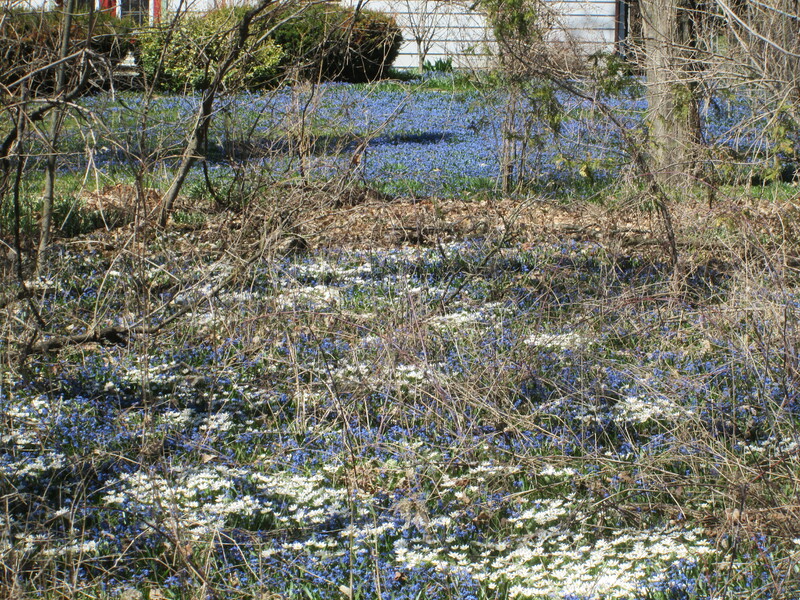 Sprinkled in among a sea of bluebells they bring the lawns to life for a short period each spring. James Hutton’s house still stands at 2072 Emberton Road, a short walk from his milling empire. Across the street from Hutton’s house he donated land for the Methodist Church. In 1885 it was decided to combine the nearby congregations in Page and Springbrook. 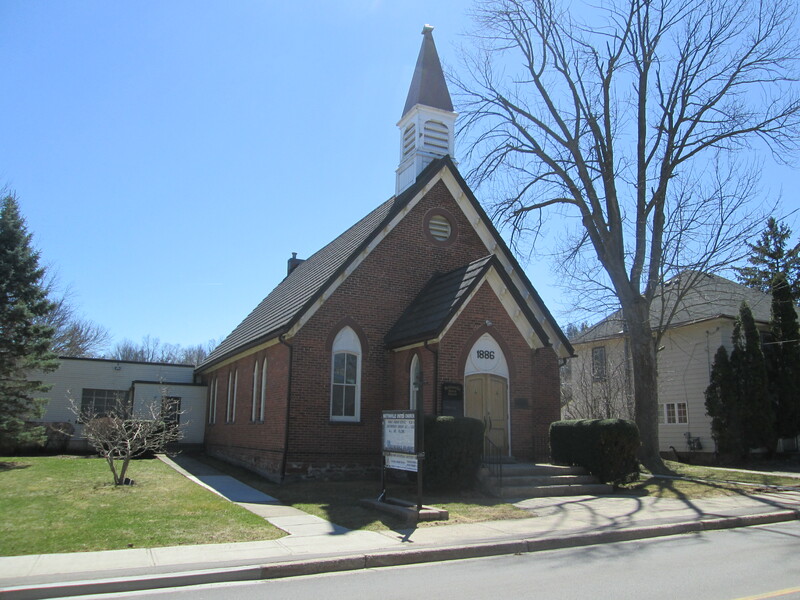 The Page church was demolished and the wooden church in Springfield was moved to Huttonville. It was placed on a stone foundation and extended by 10 feet. Then a brick veneer was added to the outside. In 1925 it became a United Church when the Methodists joined the new congregation. Today it is rented on Saturdays by the Seventh Day Adventists. Beside the church stands this building which was likely the Queens Hotel. A truss bridge used to carry Mississauga road across the Credit near the end of Emberton Road. The foundations remain on the east side of the river but have been removed on west side for road widening. This entry was posted in Credit River and tagged American Bullfrog, Bloodroot, Bluebells, Huttonville, McMurchy Woolen Mills, Seventh Day Adventist, Weslyan Methodist Church on April 19, 2015 by hikingthegta.